It was time for the shed drawing. People were anxious, excited. I spun the canister that held over 600 entries. I reached down into the mass of papers and near the bottom I pulled one out. The first words out of my mouth, “Oh my gosh…..it’s Maggie O’Donnell”. The winner of the red scooter was the winner of the shed. She was so excited, choked up, huge smile, practically in tears. No, I had never met Maggie O’Donnell until today. But you know how every once in a while, you meet someone and realize, this person is genuine? Well she is. She was so elated. She told us about how she went home after she bought the ticket, shook it and told her son, “this is the winning ticket and if I win, I’m going to give it to you”. And she intends on keeping that promise. My understanding is that Maggie is a widow and her son has done so much for her. This is her way of giving back to him. You could see how elated and thankful she was. And hey, after winning a scooter and a shed, she’s very lucky too! She was planning on going to buy a lottery ticket on her way home. Good luck Maggie! 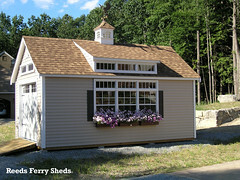 Thank you for supporting Habitat for Humanity of Greater Lowell, and congratulations to you and your son on winning the brand new Reeds Ferry Shed! –by Laurie Blanchette, Controller -Reeds Ferry Sheds, Inc.